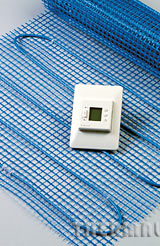 The ELEKTRA Heating Mat features a twin-heating cable attached to a fibreglass mat with a single-sided power supply and is thermostat controlled. ELEKTRA Heating Mats may be used under any type of floor suitable for heating; ie. under any floor which radiates heat easily, such as floor tiles, slate, low pile carpet or some wooden floor panels. They are fixed directly to a prepared floor in a screed of self-levelling compound or a cement-based screed. At 0.5m wide and available in lengths from 2m to 16m they can be easily shaped to suit the floor layout. No special tools are required.